I’ll call it the tea-snacking-cycle. It happens to me ALL the time…and I really do mean that. I get home from school – I’m tired (cycling 7 miles a day isn’t the most energising thing ever), I’m probably a bit annoyed at the pedestrians who think the road = sidewalk, and drivers who think cyclists don’t mind screeching to a halt so they can turn in front of you and save 5 seconds of their journey time. I’ll make a snack or whatever, and boil the kettle to make some tea – the aim being to reach a point where I both have a cup of tea, and my food. Can you sense the problem? I’ve normally at least half finished my food once the tea is made. That’s one problem. Then comes the second, do I go get more food? Or do I wait until an actual meal time? Ugh. Yeah, there seems to be an obvious solution to the problem – make the tea, then get the food, but I think my brain is working against me and just automatically makes me get the food first. Damn you brain. 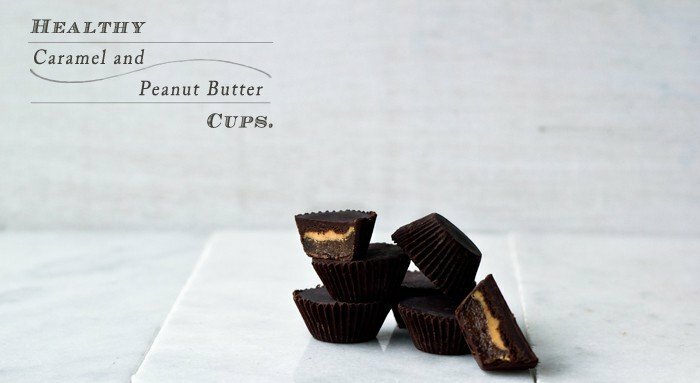 One thing I’ve found though is that if I have these caramel peanut butter cups around, I can normally only manage to eat one; they’re so crazy rich and decadent, it’s pretty much solving my tea-snacking-cycle problem! 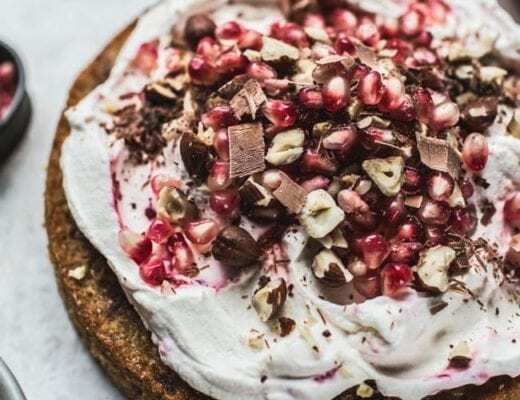 Make sure you have your sassy pants on when you’re ready to make these: They’re full of fibre, healthy fats, antioxidants, deliciousness and some protein too! They’re also vegan and thus, dairy-free! – the dates were measured while still un-pitted, and I really packed them into the measuring cup! -you’ll probably have some date caramel mixture left over, it is dangerously addictive. You can freeze it in blobs and chocolate coat them, thin it down with water or milk and use like you would caramel sauce, or just straight up eat it with a spoon. Soak the dates for up to 4 hours in warm water, drain, pit, then blend with 1/4 cup of almond milk or water. Add in the almond butter and vanilla, blend again. Line a mini muffin pan with mini-muffin liners. Put about 3/4 tsp of melted chocolate into the bottom of each liner. 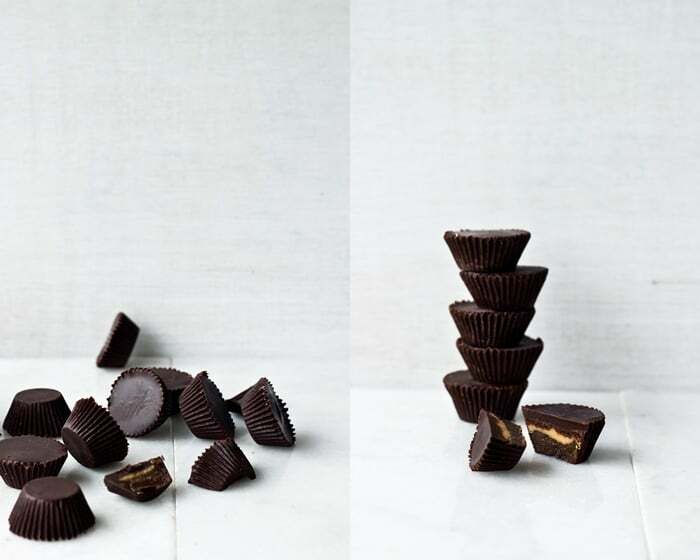 Use a small pastry brush or spoon to push the chocolate up the edges of the liners, coating them well. Freeze for 5 minutes to set the chocolate. Remove from the freezer, spoon in around 1 tsp of date caramel and smooth with a damp finger. 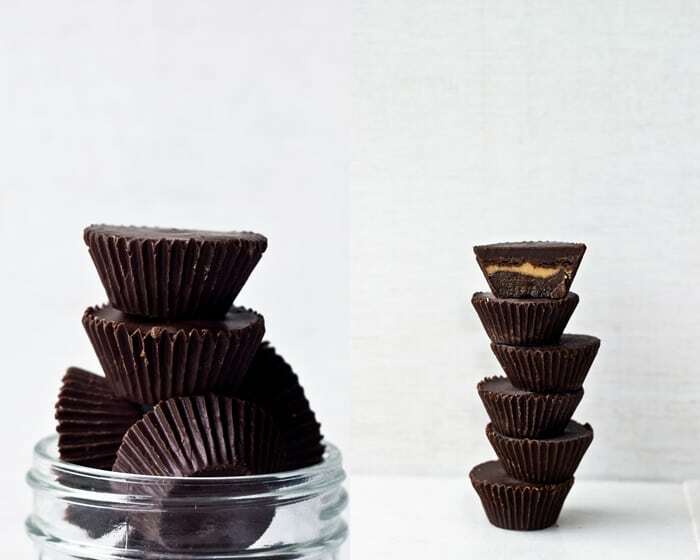 Pour around 1/2 tsp of warmed peanut butter on top of the caramel, spreading and smoothing it to the inside edges of the liner. Freeze again for 5 minutes. Top with enough chocolate to cover the peanut butter, smoothing it out as much as possible. Freeze for 10 minutes to set completely. Store in a cool (temperature wise.. not socially..) place. you had me at healthy caramel. 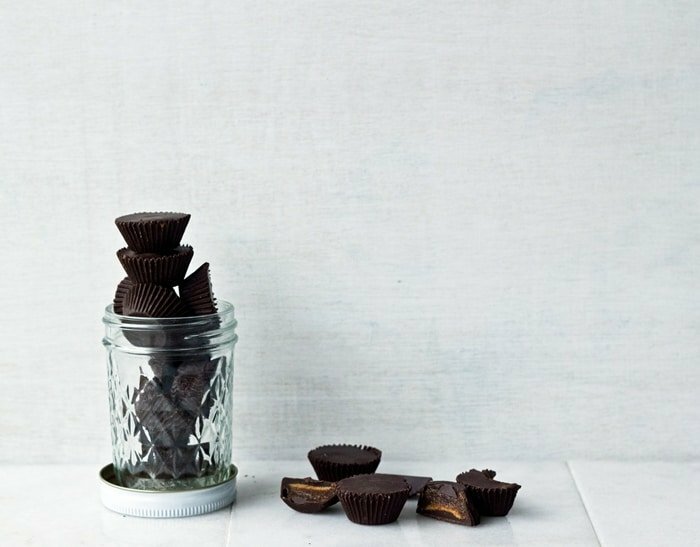 these look amazing and i wouldn’t feel so guilty with these..but maybe after a handful, that wouldn’t be so good for my hips, hehe..gorgeous photos! hahaha, I’ve probably eaten a few too many recently :/ I’m just trying to focus on the healthier aspects of them though, and hoping that’ll balance the chocolate out 😉 Thanks! Wow! I am so going to try these!!! Making these tomorrow. They look SO yum. BUT. WHAT. IF. MY. SASSY. PANTS. ARE. IN. THE. WASH.
then you’d better wash em up fast!! They look so wonderful! Usually I take the super lazy route and do chocolate + peanut butter, but yours sounds much more interesting and not much more work. ahh, sometimes you just need pure chocolate and pb! Thanks! These look amazing! l will have to make them. If you want them grain free you can substitute the cornstarch with arrowroot powder. Oh yum! I’ve been craving chocolate for days now (eating it doesn’t seem to help :P) and these look sooooo good. Just discovered your blog and love it! I think this would be great with raisins as well as dates! Do you think these would travel well through the mail, or would they need to remain cold the whole time? 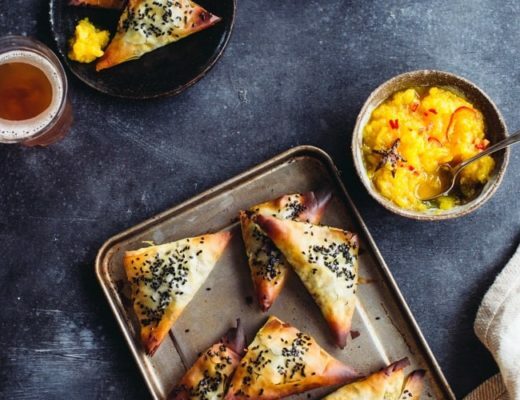 Hi – this look really yummy and I’m looking forward to making them. Question: why do you specifically say to have non-pitted dates. Do you take the pits out at some point? I totally have the same problem every time I get home from school- I open the front door and head straight to the kitchen. I usually don’t have treats as goods as these lying around though, but after finding this recipe, I probably will soon!